The family of the Sikus There is a great variety of Sikus which come from the different regions of the high plateaux of the Andes, and whose names and tones vary according to their sizes. These wind instruments are made up of two parts, each one of them being made of a series of bamboo pipes of different sizes.The Toyos are the biggest flutes of this family (their low-pitched pipes being as long as 1.5 meters). They are followed by, in decreasing order, the Sankas,the Maltas and the Chulis. The family of the Quenas . They are Indian flutes cut out of bamboo.The Quenachos are the biggest flutes of this family, followed by the Quenas and the Quenillas. The Rondador is an Ecuadorian wind instrument made out of thin bamboo sticks of unequal size. They can be tuned in different tonalities. The Antara It looks a little like the Siku, with a few differences. It has indeed one row of pipes, and is tuned after the pentatonic scale (5 notes), and can also be tuned after the diatonic scale (7 notes). The Guitar An instrument brought by the colonizers in the 15th century. 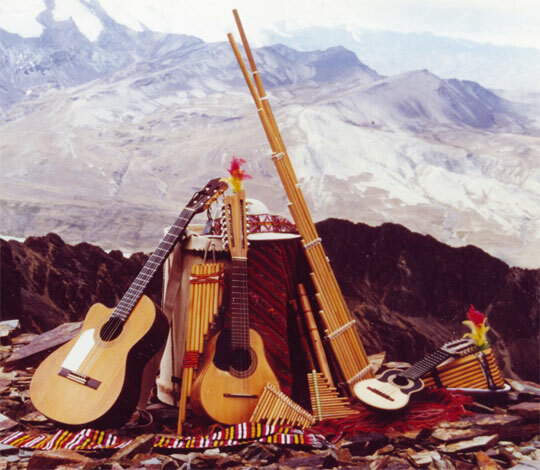 Since then, this instrument accompanies the traditional and folk songs of the Andean countries. The Charango is a small 10-nylon string Bolivian instrument, high-pitched, which was originally made out of armadillo shell. It is very representative of the music of the Andes. The Hualaycho, smaller than the Charango, it is made out of wood and has metal strings. 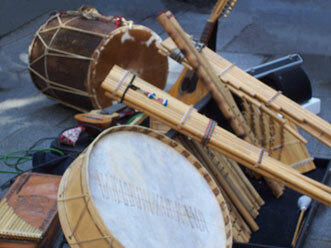 This instrument accompanies more traditional tunes. The Bandolin is a 15-metal string Ecuadorian instrument, used in traditional Ecuadorian songs. The chords on this instrument are the same as those on the guitar. The Bombo This big drum is covered with goat or sheep skin, and produces a much muffled sound. 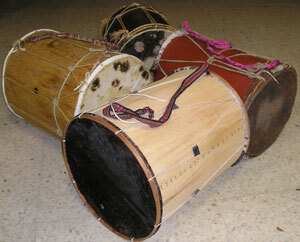 The Wankara It is a small drum, whose sound is higher than the bombo’s. It accompanies above all autochthonous rhythms. The Chaj’chas This instrument is made out of goat hooves sewn on a piece of cloth.